Take the 1 Minute Quiz to Predict Your Fully NCAA Potential! Grit: “perseverance and passion for long-term goals.” — Angela Duckworth (the godmother of grit) Before we discuss how to build grit in ourselves, in our teammates, and in our children, let’s continue to refine what grit, actually is (and isn’t). In a variety of studies, grit has been shown to be predictive of success. Whether it be athletes, West Point cadets, spelling bee champions or Ivy leaguers, grit is a learnable trait that enables improved long-term performance. Angela Duckworth, associate professor of Psychology at the University of Pennsylvania conceptualized a formula for success as follows: Achievement = Talent x Effort To illustrate the point, let’s look at two individuals and determine who might be more be more successful. For this example, we’ll use academics as an example (but this applies to all avenues of life including sports, languages, socializing, etc). JENN is ‘above average’ intelligence, having scored 120 IQ. Who is going to be more successful? Based only on IQ it’s a clear winner, but would these facts change your mind? JANE puts in 2 hours each week to study chemistry (assuming 20 hours available each week, that would be 10% of her time). JENN puts in 3 hours each week to study chemistry (with 20 hrs available, that would be 15% of her time). Does that change your mind about who you’d pick to do better at chemistry? Let’s pipe them both into the Achievement calculator and see: JANE Achievement = 145 * 10% = 14.5 score JENN Achievement = 120 * 15% = 18 score WINNER: JENN — She might not be as smart, but by that extra hustle, she’ll have a better chance at success. Effort matters! Grit is consistent effort, it’s that ongoing commitment toward goals. Lastly, put together a list of everything you can (and should) do to persevere and maintain your passion toward those goals… aka — how are you going to be gritty? (e.g. contact 3 additional coaches each month, watch one extra pro game on TV each week, find a camp that has 10+ colleges attending, etc). DO ACTIVITY THREE (17 minutes): Build Your Pillars of Grit. On a piece of paper, list each of the below 10 pillars and your response. Build a Moral Compass: What are your positive values? Family first? Being fair? Honesty? Giving and getting respect? Kindness to others? What? Having a Higher Purpose: What is your spiritual or religious connection to other people and the world or universe? Leveraging Social Support: Who can you rely on? What family members? Teachers? Friends? Role Models: Who do aspire to be like? Are there people you know that you can aspire to be like? 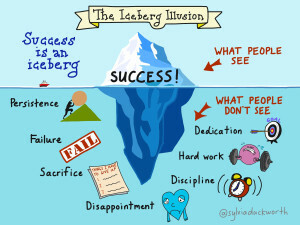 That you’ve seen work hard (and succeed)? Be Fit: Healthy body = healthy mind. How do you stay fit? Grow Your Brain: How do you challenge yourself? What are you doing to stretch your mind? Where are you learning new ideas? new skills? Mental Flexibility: Are you open to different feelings? Are you open different approaches to problems? Are you ok with change? Be Optimistic, but ‘Really’: What good things could truly happen in your life? Find a way to give yourself positive vibes about something realistic (e.g. winning the state lottery — NO; winning at church bingo night — YES).